I had a dinner party last night. There were seven of us for dinner, Ed, Claude, Thomas (without whom we would have been sitting on the floor, more on that later), Maureen, her husband Russ, and Daniel, who was also my co-chef for the night. The day started out very early, well, early-ish at the Ferry Plaza farmer's market. I met up with Daniel and his sister Doree to shop for inspiration and provision for the night's meal. The market trip, as always, took far longer than we planned. That, together with the hour or two we lost contemplating the plethora of dim sum offerings at Harbour Village across the street, kept Daniel and I away from any cooking until 3.30pm. Daniel, if you haven't already known this, is a chef by profession, and has worked under a number of fabulous chef, but perhaps his best work yet was last night. We put out eight dishes for a table of seven! At seven o'clock, sharp, Claude showed up. I imagine Claude was standing there in front of my door with his finger two inches from my buzzer, with his two arm loads of wine, waiting for seven o'clock to roll around, on the dot, before he rang the door. Upon realizing how late the kitchen was operating, Claude promptly opened one of his fantastic wines, perhaps to gently nudge Daniel and I to work a bit faster. Then Maureen and her husband arrived, Ed closely followed. Maureen, ever so nice, offered to help and was handed two bunches of Thai basil to part the leaves from the stems, a similar aid offer from Ed landed him a few cucumbers to peel. The last to arrive was Thomas, who was ever so obliging in bringing along the chairs on which my dinner guests would later sit. I bought a new (old) table, you see, but have yet to buy chairs to match it. So, thanks to Thomas we finally sat down around the table at which the following dishes were served. This is one of my favorite Thai snack food. 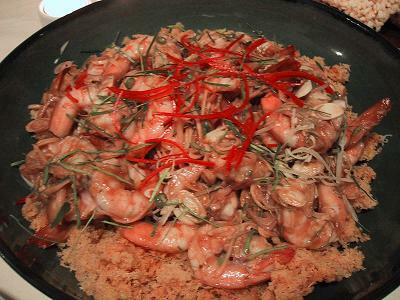 The relish, Na-tung, is usually made with a mixture of pork and shrimp. I made this one with only minced pork today so Daniel, who has shellfish allergy, could eat it. The Na-tung base is a paste made of dried chillies, cilantro roots, white pepper and garlic, cooked with coconut milk, pork, shallots, and lots of peanuts. The taste is sweet and salty, just a perfect waking up your tastebuds dish. I made my own spice mix for the meat marinade, with turmeric, curry powder, coriander seeds, cardamom, clove, and cumin. The peanut sauce was made with a base of Massaman curry paste, with coconut milk and freshly ground peanut butter. 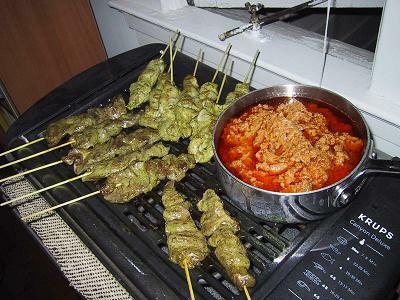 This was something of a participatory dish, as dinner guests were asked to grill their own satays. I think it was much more fun that way, plus, Daniel and I were far too busy in the kitchen to bother with it ourselves. 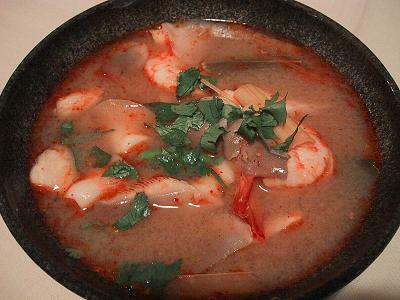 The famous Tom Yum Goong, need I say more? The recipe is available if you want to know how it's made. The Thai name of this dish, Sreng-wah, translates to “pretend”. 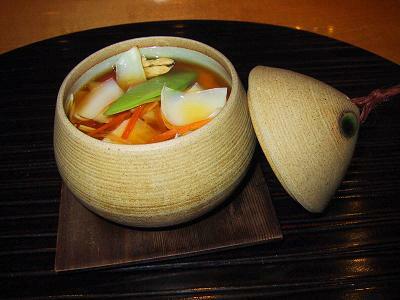 This original inspiration for it came from a dish from the South of Thailand, and was originally made with fish kidney. The wimpy Bangkokians apparently couldn't quite deal with such an exotic an ingredient, and so came up with a mock dish, mimicking the seasonings of the original dish, but made with a much more mundane ingredient of shrimps. This dish is my favorite Thai salad. I adore the interplay of textures, the crunch from the Pla-foo (crispy fish) against the softer flesh of the shrimps. I also love the decidedly tangy and aromatic dressing, made of tamarind, fish sauce, lime juice and palm sugar, tossed with plenty of lemongrass, lime leaves, shallots, young ginger, and chillies. The one we made last night was absolutely perfect, down to every minute detail. 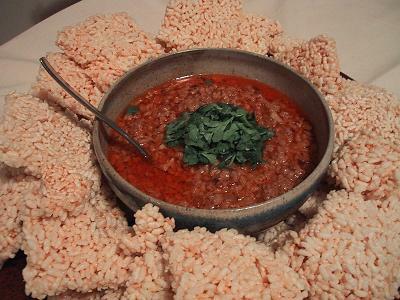 I dare you to find a better version of Sreng-wah than the one Daniel and I made last night, anywhere. This clam dish is also another one of my favorite Thai dishes. The reason is perhaps because it uses as the main seasoning, my aunt's famous Nam-prik Pao, or chilli paste. I used the batch I made a couple of months ago. 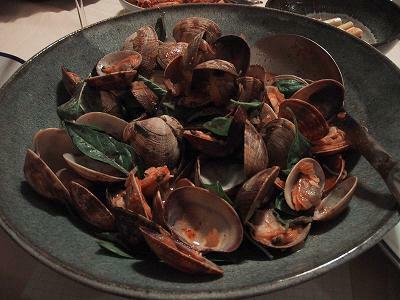 The clams were bought live from Clement st. and were sweet and absolutely delicious in the spicy and ever so slightly sweet sauce. This was Aunt Chawiwan's famous green curry of chicken and apple eggplants. I was a little bit disappointed by my execution of this curry, actually. I misjudged the amount of chicken and eggplants we put in, so the curry was a little bit too mild. I should have used a bit more curry paste. Too bad. The Hormok in Thailand is commonly cooked and served in a small container (Gratong) made of banana leaf. It can be steamed or even grilled. 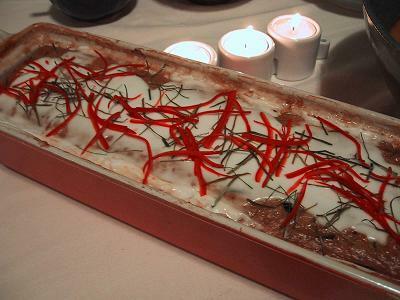 The one last night was cooked in a Le Creuset terrine in a water-bath in the oven. 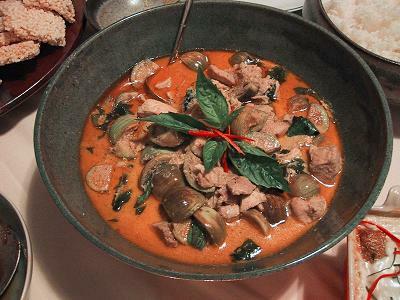 The curry was made with simple red curry (but with a little bit more lime leaves and lemongrass added to the basic red curry paste to enhance the taste of the seafood), coconut milk, crab meat and scallops, and garnished with julienned lime leaves, Thai basil and julienned red chilli. For some reason we forgot to take a picture of this. Oh well. I must say that this one turned out even better than the one I made in London. Daniel, ever the master chef, suggested that I braised the belly pork inside the oven rather than my usually stove-top method. Boy did it work?? The pork belly was so tender it practically melted on my tongue. Unfortunately, Daniel and I had such a late start that we had to forego a couple dishes that we had planned to make. 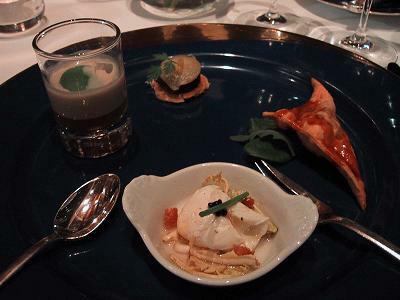 One of those missing dishes was a dessert of egg custard baked inside a Kabocha squash. I'll just have to do it next time. Claude brought many fantastic bottles of Riesling to compliment my food, all of which I consumed without even asking what they were. I simply drank what he poured into my glass. It was a pretty good policy last night. Heck, drinking whatever Claude poured into my glass probably qualifies as a good policy ANY night. Again I shall let those more knowledgeable than mere me tell you about the wine. I believe we also drank a bottle that Ed brought; again I shall let him tell you about it himself. Scary Movie? Currywurst on film. Jschyun on eG told me that her cousin made a film about Scarywursts. It's called, I'm not kidding you, “Best of the Wurst”. How can you not love it? Best of the Wurst chronicles a Korean American woman's discovery of Berlin through its ultimate snackfood--Currywurst. Come with us as the currywurst stands of Berlin provide a glimpse into the city, its neighborhoods, its history and inhabitants. More. eG Food Blog: from Scarywurst to Buerehiesel, what a ride! My eating life today has been quite a roller-coaster. 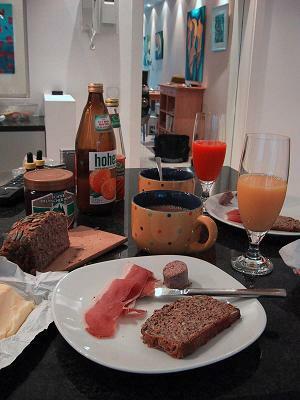 The day started out in Heidelberg with the usual breakfast of bread, butter, and honey, and a great big mug of coffee. Adding to the usual breakfast diet were some saucisson sec and Vacherin Mont d'Or cheese, leftovers from last night's simple dinner. 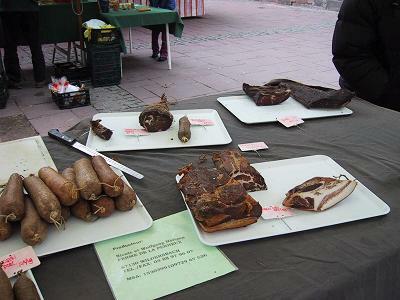 The Vacherin and the saucisson both were fantastic. If you've never had Vacherin, I suggest you try it whenever you've got a chance. It's stinky, earthy, creamy, runny, and absolutely delicious. For lunch, we continued our search for Scarywurst, aka Currywurst, a relic from his childhood that he insisted I try. 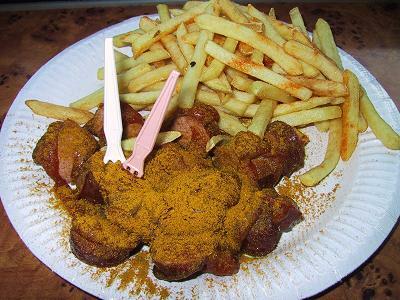 When Thomas emailed me a photo he found on the internet to show me, it was so spectacularly frightening that I started calling it Scarywurst rather than Currywurst! Look at this picture and see for yourself! We found it at a tiny stall at the outskirt of Heidelberg. So we had Scarywurst for lunch. It was actually not anywhere near as disgusting as it looked. The wurst was freshly grilled, sliced into small pieces, then smothered with ketchup and curry powder, then served on a paper plate with french fries. Plus, it was kind of a fun way to prepare ourselves for the dinner at the three-starred Le Buerehiesel. Near dinnertime, we hopped into the spunky Audi and raced down the fabled German Autobahn to Strasbourg, about 150 km away. Barely an hour and a half later we arrived with over an hour to spare, so we decided to take a walk around the Petit France area again. This area was where I bought all those fantastic cheeses the other day. I wanted to buy another Vacherin for my lunch on the plane tomorrow, so we went back to La Fromagerie des Tonneliers again. Unfortunately, luck wasn't on our side when it came to photographing this place. When we were there the other day, the battery on my camera was dead. Today, we left the camera in the car. Sorry. Anyway, we bought a petit Vacherin, a small chevre called Briquette de Langoumois, and another local Alsace cheese called Berville. The shop also sells some other food items, so I grabbed a jar of mi-cuit foie gras, a jar of creamy miel de fleurs de Provence, and a jar of confiture de prunes Reine-Claude, which is a type of prune local to the Alsace region. On the walk back to the car to go to the restaurant, we stumbled upon another nice looking shop selling confitures, so in we went and out we walked with five more jars, one of confiture aux clementines et Campari, two jars of confiture de quetches, and a large jar of miel d'acacia). By then Thomas's eyes were filled with panic, or perhaps it was marvel, at my ability to acquire ridiculous amount of things to eat in an improbably short time period. (Right, I forgot to mention another tiny stop at a patisserie to buy a croissant and two éclairs for tomorrow.) Anyway, I decided to give it a rest and went on our way in search of dinner. 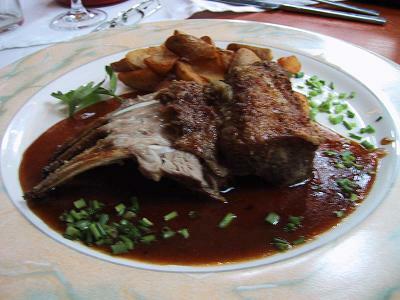 Le Buerehiesel is located in a beautiful old building in the Orangerie park just across the street from the European Parliament building. I'm sure business from all the Euro-politicians is almost enough to keep a three-star place in the Black. Before we arrived, I decided that I would bring my camera, but if it looked as though I would disturb other patrons, I wouldn't use it. Luckily, we were seated at a nice window table, far from other people, so you've got the pictures to see after all. We decided to order le menu truffe. For Aperitif, I had a Muscat d'Alsace and Thomas had a champagne. I forgot to ask for the names of these, sorry. With dinner we shared a bottle of Kientzler, an Alsace Grand Cru from 1999. It was very dry and fragrant, and was perfect with the food. The first to come was some amuse. These items were not listed on the menu so I couldn't give you the name in French, but they were poached quail egg in vinaigrette with dandelion greens (This is the second day in a row that I saw dandelion greens on a French menu, perhaps they are in season already? ), a fried little pocket of duck and vegetable, a slice of Boudin Noir, topped with a sliced of cooked apple, on a tarte fine, and a small glass of gelee of lobster and creamy chestnut sauce. My favorite was the gelee in chestnut cream, which was a fantastic mix of flavors and texture. The second favorite was the boudin noir. The other two amuse were just good, not great. 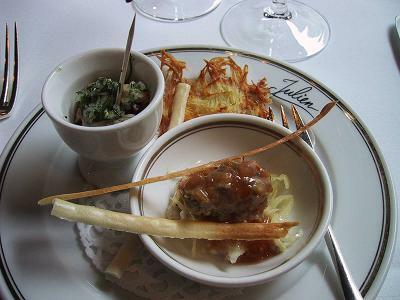 Next was a Terrine de Poireaux et Coquilles St.Jacques aux Truffes. This was fantastic. The fantastically fresh scallops were ever so slightly poached before being added in the terrine with leeks. The dish was subtle yet fully flavoured, a difficult balance to attain IMHO. 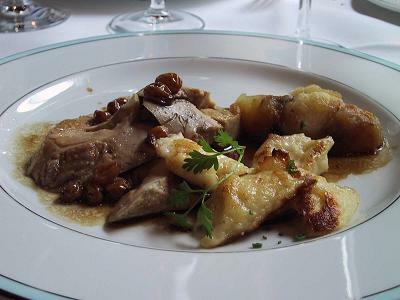 Grenouilles poelees aux truffes, Lasagnes truffees et jus mousseux. The chef here is rightfully famous with his frog legs. 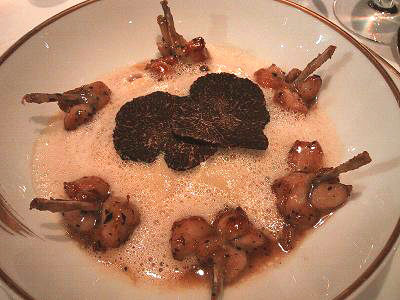 This dish of frog legs in truffle sauce served with a ‘lasagne' of truffles and caramelised onions. The lasagne was a bit more like a ravioli than a lasagne in my opinion. Well, whatever it was, it was simply fantastic. I nearly cried at first bite!! 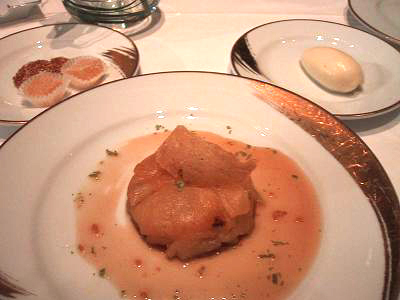 Poitrine de Pintade aux truffes, petite tourte au foie de canard, marrons et pommes de terre. 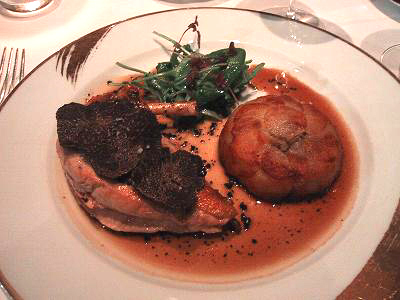 Guinea fowl's breast, roasted with truffles underneath the skin, in truffles and jus sauce. 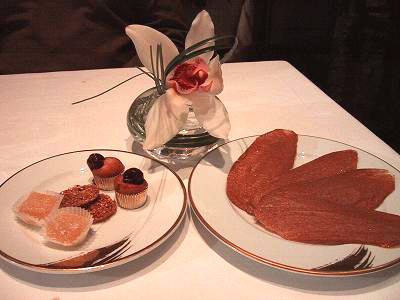 The small tart was of duck foie gras, chestnuts, and potatoes, encrusted in thin slices of crisp potatoes. Cheese! Oh, what can I say about those cheeses, except that they were all to die for? The pre-pre-dessert were two small plates of thin cinnamon wafers, petits financiers with cherries, grapefruit pate de fruit, and caramelised sesame cookies. 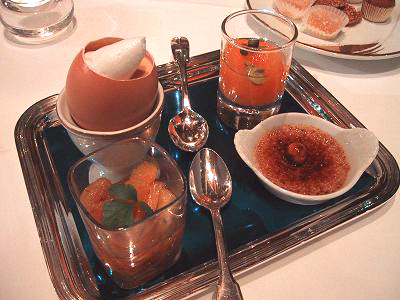 Then the pre-dessert arrived, two small glasses of fruit compote, mainly orange, with a few other things thrown in for good measure, a tiny creme brulee of macademia nuts, and the creamiest egg custard ever topped with meringue. 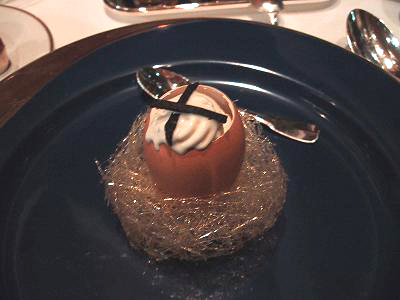 Oeuf de Poule glace a la truffe fraiche. The most amazing icecream I'd ever had. The glace was light and fantastically creamy, with small bits of truffles throughout. This is the first dessert made of or garnished with truffles that I've ever liked. The truffles felt like they belonged perfectly in the glace, instead on being a gimmick added on for more value. Pine apple tast with Sizhuan peppercorns, vanilla, and lime, served with a pineapple sorbet. I wasnät too wild about this one. The tart was sweet and tated of canned pineapples. Yuck! 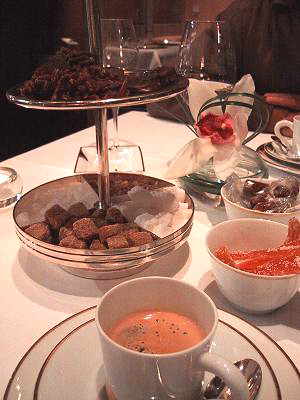 The last course was coffee, served with chocolate truffles, candied grapfruit peels, caramels, and assorted sugar. They were all great. I'm off now to bed, to catch a few hours before my flight back to California. Breakfast today was much like the last two days, so I didn't take a picture. I was invited to lunch today with a friend's family. They live in a city in Germany, only about two kilometers from the French border. 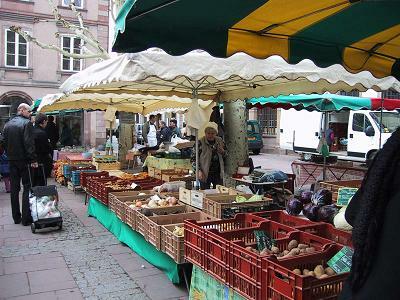 The area has changed hands so many times between France and Germany, the last change was not too many decades ago, that the food, the language, and the people are pretty much bi-cultural. The scene at the house was slightly surreal, I must admit. A Thai girl visiting a German family, but we were all speaking French because that was the language that everyone, including the 70 yr.old grand-mère, spoke. In fact, the grand-mère could speak so many languages, French, German, Italian, Spanish, even a bit of English, and she kept using whichever language that came first to her mind. At one point she said, "I enseigne con flauta", one sentence, four words, in four languages. How fantastic was that? We had lunch at a local restaurant named Canapé. Just like everything else in that area, the restaurant was a mix of French and German food, even with a bit of Italian pasta thrown in for good measure. 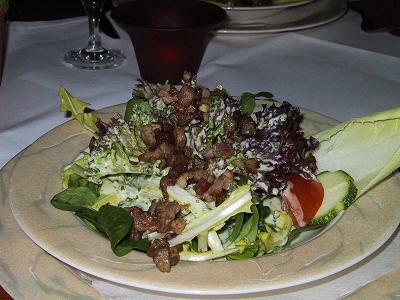 We started with a salad of frisee, lettuce, dandelion, and a healthy heap of lardon, in a creamy herb dressing. It was very good. 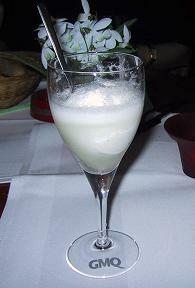 The next course was a sorbet of lemon, in champagne. How indulgent! Absolutely delicious. Next was grilled mullet in langoustine sauce, served with fettucini. Someone translated the name of the fish from German for me as river bass, so I ordered it. 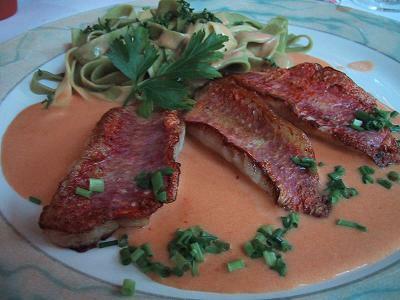 When it arrived, I was surprised to see mullet, or rouget in French. If I had known that it was mullet, I probably wouldn't have ordered it, as I found mullet this far from the sea slightly dubious. Luckily the fish turned out quite fresh, and the sauce delicious. I also stole a few bites of this rack of lamb in rosemary sauce. 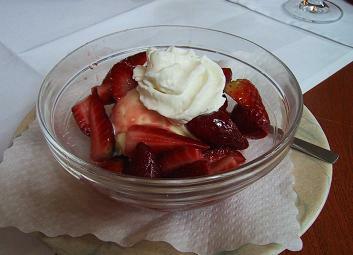 The dessert was house-made vanilla icecream and strawberries. Yes, I know what you're thinking, strawberries in February! (roll eyes) The icecream was good though. 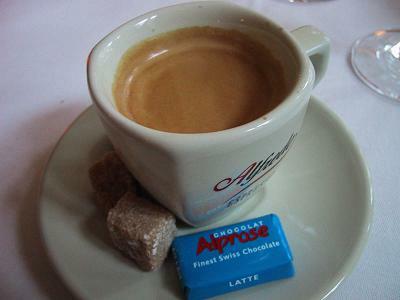 And of course, a proper espresso to end the meal. We drank a bottle of local Reisling, whose name I forgot to take down. For dinner, we drove around Heidelberg looking for scarywurst (I'll tell you all about it later), but couldn't find it so we ended up at a Thai semi-take out place. Thomas showed it to me for fun, as it was considered the best and most authentic Thai place in all of Heidelberg. It looked pretty good, in fact, so, on a dare, I decided to eat dinner there. 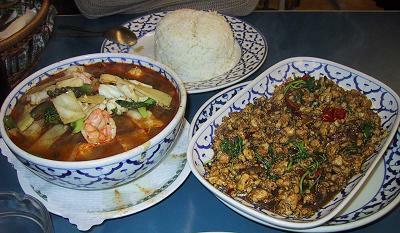 We split two dishes, Gai Pad Kra-pow (chicken an holy basil) and Gang Pa Talay (Jungle curry with seafood). They weren't too bad, really, but the Pad Kra-pow had to much dark chinese soy sauce in it, so it tasted a little muddy. Both the dishes were spicy as hell, even for me. Yesterday was in Strasbourg. You'll just have to make do with pictures for now. I've got no time to do much online as we are running today to another small town in Germany. Thomas and I had a rendez-vous today with Marie-ève and Lucas who came from Zurich to meet us in Strasbourg for a lunch at Julien, a Michelin * restaurant in town. After picking up Marie-Eve and Lucas from the train station, and stopping once or twice along the way to join the huge manifestation and yell in support of better treatment for Ochalan, the Kurdish freedom fighter/terrorist (depending, of course, on your point of view), we trekked across town on foot to lunch. On the way we stumbled upon this market. We had no time to properly survey the market, but I managed to snap a few photos anyway. 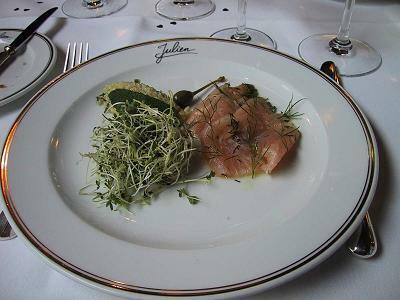 When we arrived at Julien, our nice table by the window with the view of the cathedral was waiting for us. 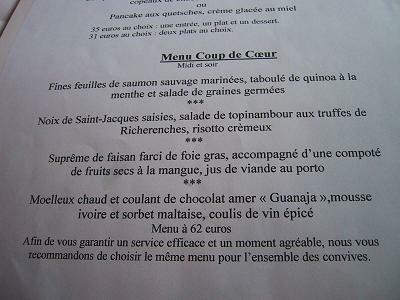 Lunch at Julien, menu Coup de Coeur. The amuse consisted of a few cold mussels marinated in shallots and parsley vinaigrette, and a dumpling of mince fish(?) in a slightly sweet and sour sauce. The mussels were quite fresh and perfectly seasoned in the marinade, but I was less happy with the other thing. I wasn't even sure it was fish! It just tasted vaguely of some type of seafood, and I wasn't wild about the sauce either. Marinated wild salmon, served with Quinoa taboule and sprouts salad. The saumon was almost in the style of lox, but without the smokiness. It was great and almost melted in the mouth. I didn't quite get the sprout salad though. Sprouts in general have this slightly woody taste that I dislike. 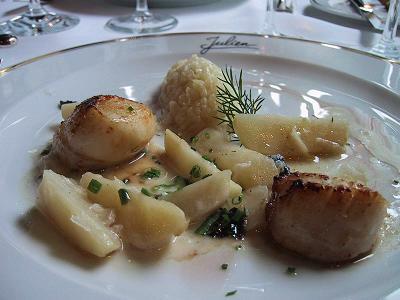 Scallops with a salad of jerusalem artichoke and black truffles from Richerenches, and risotto. This was the star of the meal. The scallops were fresh and sweet, the jerusalem artichoke salad was lovely, though the truffes de Richerenches were largely missing in action. The meat course was a Supreme of pheasant stuffed with foie gras, accompanied by mango and dried fruit compote and a reduction sauce with port. I wasn't too happy with this, and left almost half untouched. The pheasant wasn't at all gamey, in fact, it was so benign it could have very well been turkey. 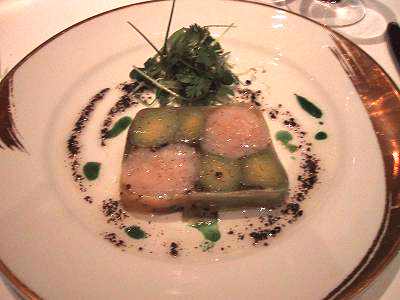 The foie gras was somewhat tasteless, which was strange as it is the specialty of the region. Too bad. 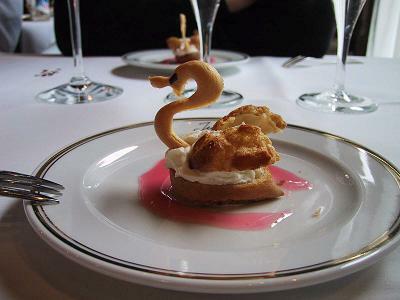 The pre-dessert was a swan with cream and coulis. It was just ok, fancy but somewhat pointless presentation, really. 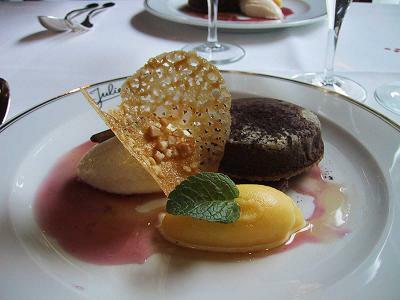 The dessert course consisted of a “molten” bitter chocolate cake, white mousse and orange sorbet, in spiced wine coulis. I wasn't too happy with this either. The supposedly bitter “molten” chocolate cake was neither bitter nor molten. The sorbet was also far too cloyingly sweet. The mousse was ok, but nothing spectacular. The tuille cookie was not crispy. We had a bottle of Riesling that was chosen for us by the sommelier. It was quite good, though they failed to list the name on the bill so I couldn't tell you what we had. After we saw Marie-Eve and Lucas back to the train, Thomas and I went in search of a good cheese shop. We found one, La Fromagerie des Tonneliers, which is owned by the same people who own the famous cheese restaurant La Cloche de Fromage. 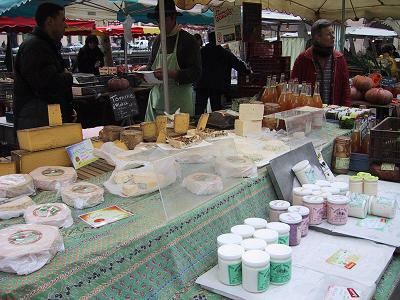 The fromagerie carries all sort of raw milk cheese from all over France. When we found the place, there was a big sign in front exclaiming “Le Vacherin Mont-d'Or est arrive”. So of course, naturally, we bought one. I also insisted on a slice of Bleu d'Auvergne, even though it's not from this region. I've just been craving it so long. I also got a Valencay, a goat milk cheese formed into a pyramid shape. And to also get something local, we got a big slice of local Munster cheese. 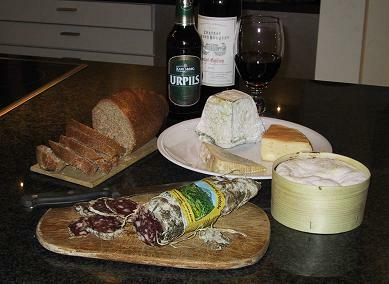 After the big lunch, dinner was a simple meal of cheese, bread, and saucisson sec (also bought from the cheese shop). To drink were a glass of bordeaux and a bottle of Karlsberg. I was here for dinner Friday night. 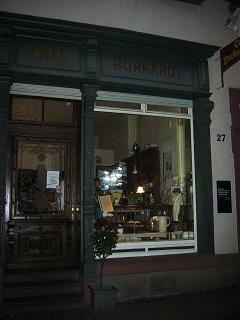 A small home style cafe in Heidelberg. It was a nice little place that had the look of old fashioned Germany. Well, what do I know about old time Germany, but that's what Thomas said. I really liked it though, the room was very cozy, with old wooden tables and mismatched chairs. The place was utterly devoid of tourists, but was populated with locals and people who looked like old professors and (somewhat) mad scientists from the university. 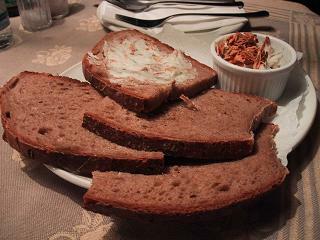 Schmalzbrot, rye bread served with lard and dried onion. I wasn't a big fan of this one, actually. I was intrigued, but found the lard tasted too much of, well, lard. 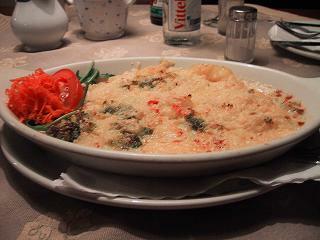 Kartoffel-Kohl-Auflauf, a casserole of potatos and cabbage with bechamel sauce topped with cheese. It was decidedly stinky, and looked sort of ugly, but was absolutely delicious! This has been quite a long day. It began this morning with a mad rush to the airport, I'm off to visit Thomas and to see Marie-ève and Lucas in Germany and France. I was famished, so I stoped at Ebisu at SFO International Terminal and had a Tonkatsu Bento box. It was surprisingly inoffensive, and definitely much better than the other Japanese place (whose name I forgot) by Gate 94. Then it was on to security check, where I had to take off my most impractical tall pointy-toed black leather boots. Oh well, at least I looked tres chic. I had a couple hours to wait at the United Lounge, with some light refreshments. A piece of cookie from the boulangerie on Pine st., a cup of Castleton Darjeeling, OJ, and tasty dried persimmons. Unfortunately the food they served in Business Class, though better presented, tasted pretty much as bad as what's in economy. The appetizer, a salad, some parma ham and smoked salmon was somewhat edible, but the entree of bacon wrapped shrimps, rice pilaf and tomato sauce was really bad. I left it prety much untouched. Luckily, I brought along some Montgomery Cheddar and Pleasant Ridge Reserve I bought from Cowgirl Creamery the other day. Now THESE are real food. 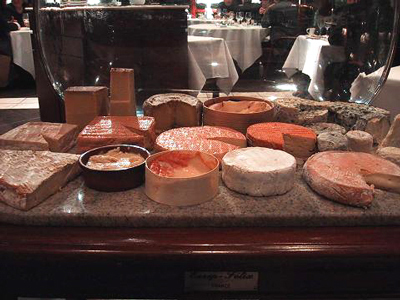 Those cheeses sent me happily slumbering pretty much until the plane arrived in Frankfurt. Right before we landed, while other passengers made do with icky breakfast (with particularly oily and yucky looking croissants), I was merrily munching on the rest of my cheese, and finished everything but the rind just in time for the landing. Just a bit over and hour later, I was safely installed at a beautiful flat overlooking the river and the castle in Heidelberg. The fridge was filled to the brim with fantastic food, grâce à Thomas. Though I was quite full from the cheese breakfast on the plane, I just had to have another breakfast. 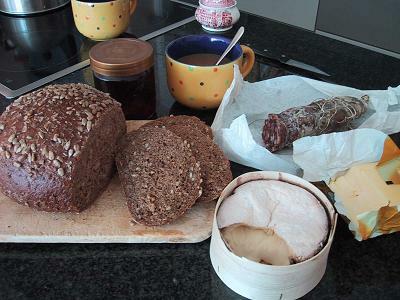 The bread is called Kürbiskernbrot, a lovely dense German pumpkin seed bread. I had two slices with butter and an amazingly fragrant raw forest honey. It was fantastic. There were also some nice Prosciutto and Leberwurst (Liverwurst), so I had to have some of those too. Also, if you looked closely in the photo, you'd see a crumbled plastic wrapping, which was what remained of the Luc Perac Perail cheese after I had my way with it. And too keep me awake and half functioning through the day was a great mug of strong European coffee. And, as if I hadn't had enough to eat already in the last 24 hour period, I'm off now to find some nice German food for dinner. I'm taking a break from regular Food Blog programming on Chez Pim to tell you something exciting. I found out today that my friend Louisa in Paris has got a blog. Why should you be interested, you ask? 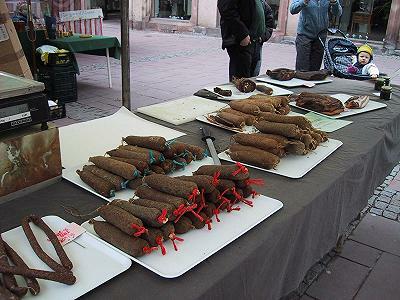 Well, if you're at all interested in my meager food knowledge espoused here chez moi, you'd be mad not to read the real stuff over at Louisa's blog Food, France, Now. This girl is great, not to mention gutsy, I tell you. A while ago she just decided to just drop her regular job and went over to France to go to the Cordon Bleu, and have since staged (interned) at Alain Ducasse, Robuchon, not to mention her up coming few months at El Bulli. She's building up quite an impressive resume, fantastic really. If I were you I would blogroll her. Now. That's what I'm doing after I'm done blogging this. I was so busy today as it was my last day at work this week, I hardly had anytime to get food. So, lunch was bought from the normally-not-to-be-found-dead-in cafeteria. The food lived up to my expectation. The salad I got today, southern fried chicken and organic greens with candied walnuts, was utterly vile. It looked inoffensive enough, but trust me, it tasted like the cook dipped each and everyone of those greens in syrup before tossing them in the dressing. 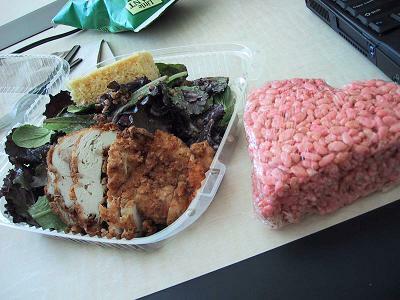 Adding insult to injury, the rice crispy treats were tainted the most repugnant shade of pink, in honor of Valentine's day, apparently. I don't know how anyone could mess up rice crispy treats, I mean, which part of "melt some marshmallows and add some Rice Crispies" did they not understand. Needless to say, it even worse than it looked. I just made it home after a very long day at the office. 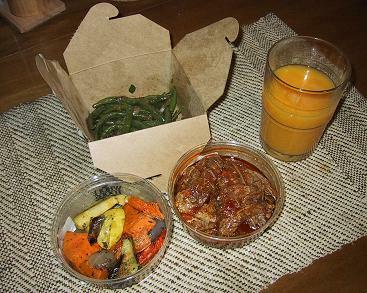 No time to make dinner, so I went to grab some quick things at Whole Foods. Well, those bits and pieces were inoffensive enough. Here's what they looked like. Oh well, I guess even a food snob can have a low day, huh? Dinner last night was Omakase at the tiny Kiss, in the company of the incomparable Malik our dear old man Melkor. The reservation was at 7.30. The only person that got there on time, Malik, was the one who'd never been there at all. Our Melkor, who, without the company of the directionally gifted Ms. Melkor, was woefully lost in the jungle that was SoMa. My lateness, how unlike me I might add, was rightfully blamed on Melkor, for derailing me by calling for directional guidance. …after merely two seconds of landing in front of us hungry ghosts. Well, perhaps I should also show you what it looked like when it first arrived, yes? 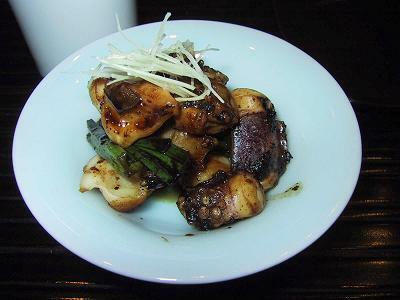 It was fantastic, the chunks of octopus tentacles were slightly caramelized on the outside, but ever so tender, with a salty and every so slightly sweet shoyu sauce and a few pieces of scallions. There was a slight misunderstanding with Melkor's dietary restriction of “no shellfish”. Naga-san didn't think that squids belong in the Shellfish category. I almost agree with him. I mean, where's the shell? Really? Anyhow, the mistake was corrected and Melkor received an Amuse of seaweed and marinated tofu instead. 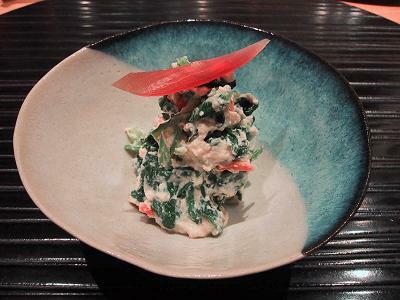 Our actual first course was a cold dish of spinach in slightly sweet tofu sauce with crispy tiny shrimps. Melkor got one without the tasty little crustaceans. 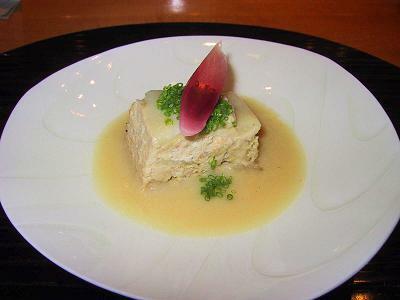 The next course was Hakusai, a layered terrine of cabbage and minced fish, in white soy bean sauce, topped with chives and a leaf of pickled ginger flower. 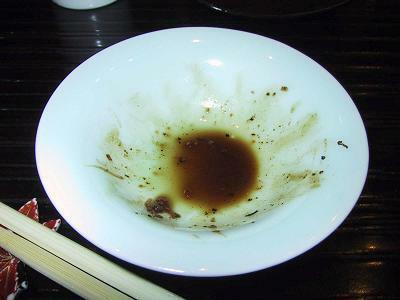 The minced fish was quite tasty, and the sauce, again, exemplified the perfect interplay of sweet and salty in Japanese cuisine. 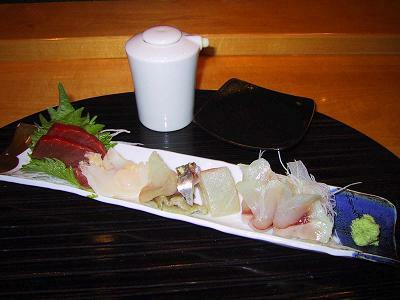 Next came the sashimi. 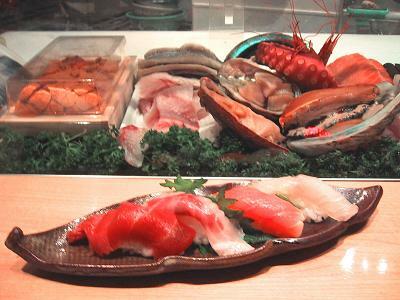 Maguro (tuna), Marugai (clam), Hirame (halibut), Halibut fins, Aji (spanish mackerel) and Suzuki. My favorite tonight is the Suzuki, but everything was great as well. Then the Chawanmushi, a silky smooth egg custard, with a piece of white fish, some crab meat, and garnished with snow peas, carrots, ginko nuts and lily bulbs. The next course is sushi. One piece each of Toro, Suzuki, Salmon, and Hirame. Sushi here is always fantastic. The rice is impeccably cooked and seasoned, and the fish pristine and tasty. 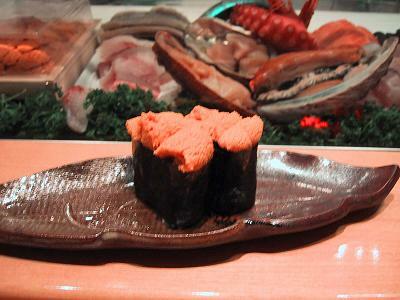 I ordered some uni, since it was not included in the Omakase. Naga-san broke out a new box for us, and they were supremely delicious. 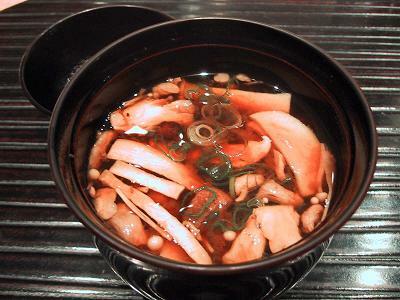 The last savory course is Akadashi, a miso-based soup with mushrooms. The perfect and soothing ending to a fantastically restorative meal. 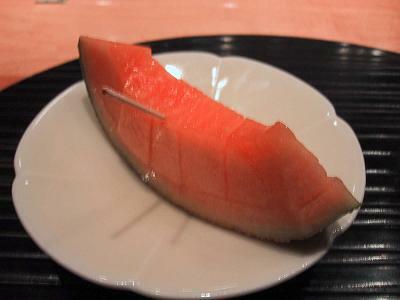 For a simple dessert, we had a perfect slice of melon. Simple, yet delicious, a fitting end to this meal. Melkor brought a bottle of Riesling, since he's not a fan of Sake. I will let the boys talk to you about the wine. Malik and I also shared three types of sake, Senshin, Tokugetsu, and Hekiiju. The subtle and dry Hekiiju is what I usually drink here, but my favorite last night was the Senshin Naga-san poured for us, off the menu. It was complex and floral, with a long sweet finish. The Tokugetsu was a bit too assertive for my taste, but Malik loved it. How much I liked the sakes was quite evident in the declining quality of my photographs as the meal progressed.